All are welcome to share in Worship at St Mark's. If you are visiting us for the first time, we pray that you will be richly blessed in Worship and enjoy your time with us. During worship we regularly celebrate Holy Communion and a further monthly celebration is held following one of the Wednesday Fellowship Meetings. Morning Worship at St Mark's begins at 10:30 a.m. each Sunday with Evening Services being held at 6:30 p.m. either at St Mark's or another local Methodist church. 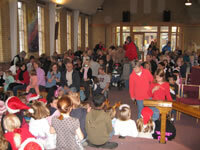 A crèche area is available inside the church at all services for families with very young children. We meet for fellowship and refreshments after morning services, providing a good opportunity to welcome and introduce ourselves to newcomers. 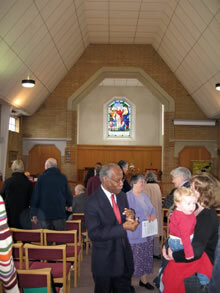 Occasionally joint services are held with other local churches. Please check here for current details. We meet together in the church hall usually on the second Sunday of each month at 3.45 p.m. for an hour of craft activities and fellowship for everyone, followed by a short time of worship in the church and then return to the hall for a meal together. All are welcome but, it would be helpful for catering purposes to let us know beforehand. e-mail if you would like to join us and if you have any special dietary requirements. Forward dates can be found through our Diary and/or Weekly Notices accessed by using the menu on the right. We look forward to welcoming you to Messy Church next time we meet.